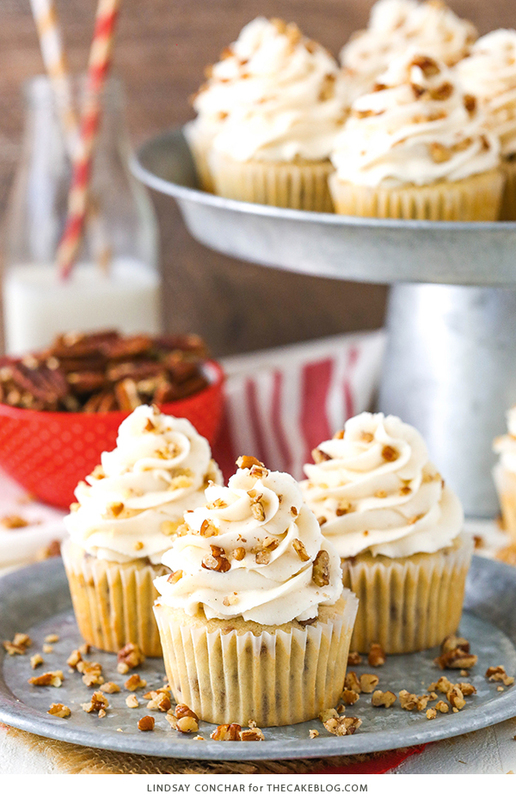 These Butter Pecan Cupcakes are made with a moist vanilla cupcake studded with plenty of toasted butter pecans! 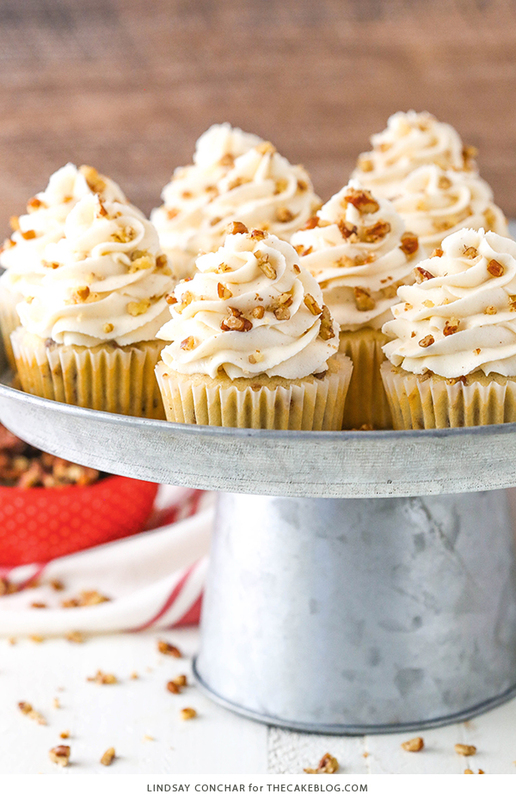 Topped with a lightly cinnamon frosting for a cupcake that’s ready for fall. 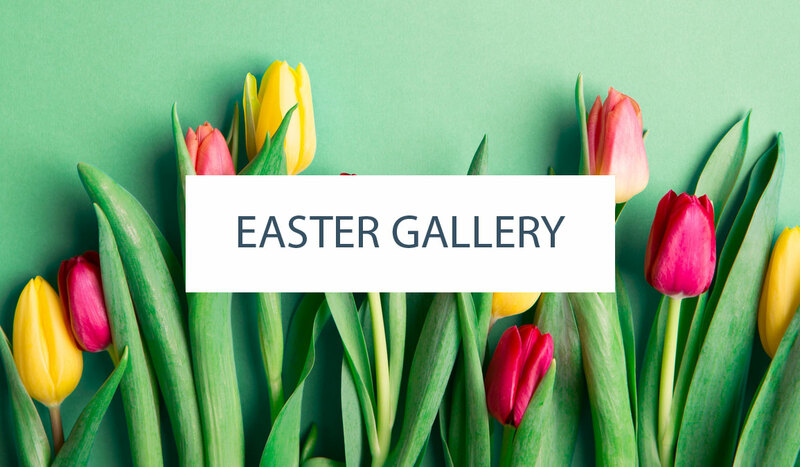 Created by our contributor, Lindsay Conchar. So, it’s always about this time year that I can’t decide if I am excited for fall to make its appearance or if I wish summer would hang around a little longer. I love the cooler weather, but I always miss the abundance of fresh berries and other fruit. I find solace in knowing that all things pumpkin and cinnamon are right around the corner. And even though nuts are delicious year-round and butter pecan ice cream is wonderful in the summer, I also tend to think of cinnamon-covered nuts as perfect for fall and winter. 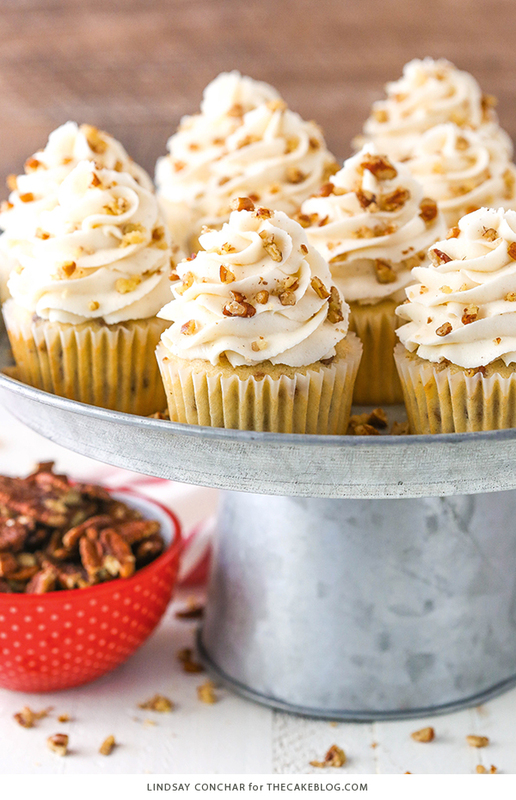 These cupcakes are not only full of toasted butter pecans, they also have a touch of cinnamon for a nod towards the transition to fall. They are a great way to hold onto summer a bit longer while also subtly welcoming fall. The vanilla cupcake base is a new favorite. It’s made with brown sugar in addition to regular sugar to up the flavor of the pecans and the fall feel. They are also made super moist by the addition of sour cream, which also adds flavor to cupcakes that I love. 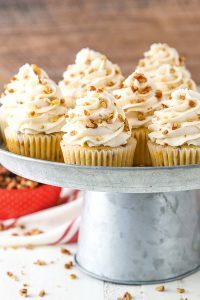 The cupcakes are also full of pecans that are tossed with a little butter and brown sugar and then toasted before adding them. You could add pecans that aren’t toasted, but toasting them really brings out the flavor and softens them a bit, which is ideal in a cupcake. The frosting is one of my favorite parts, naturally. It’s wonderfully buttery to complement the pecans and has just a touch of cinnamon added. 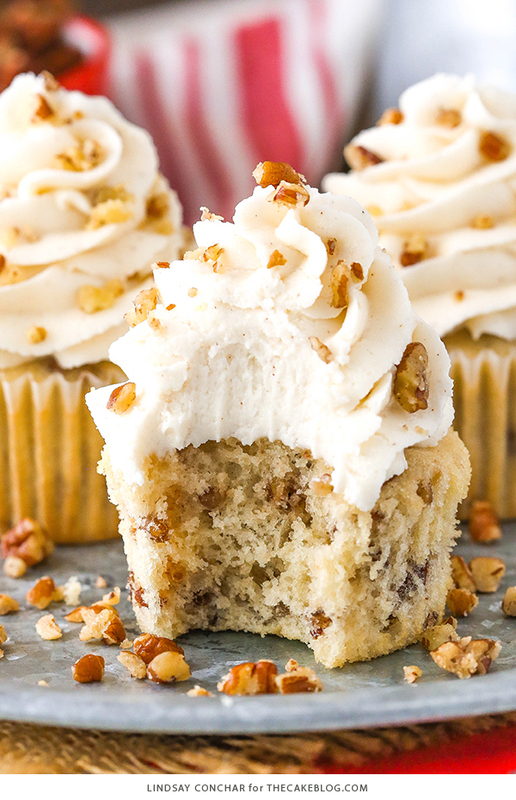 It’s not at all over powering but it’s there and compliments the nutty flavor of the cupcakes perfectly. We absolutely loved the final cupcakes! There’s an abundance of pecans but they’re not at all overpowering. The cupcakes themselves are light, fluffy and full of flavor. You could easily sit down and eat several at a time – they’re that good! Several of my taste testers declared them a new favorite! 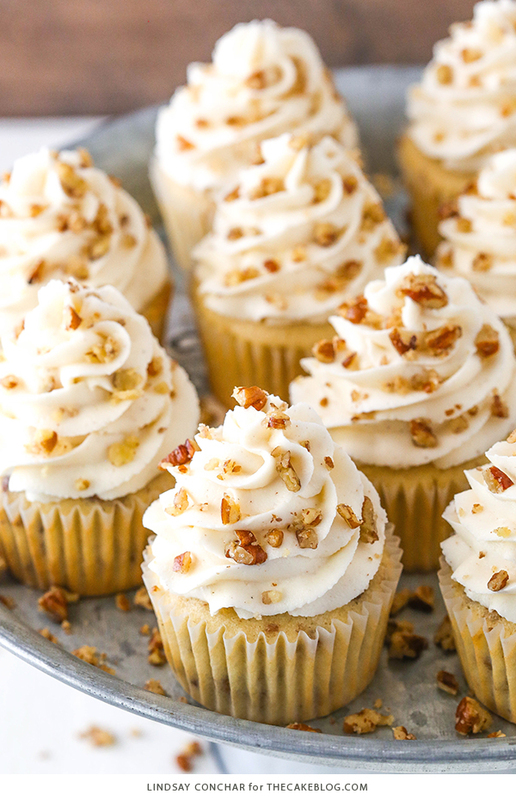 Moist vanilla cupcakes studded with plenty of toasted butter pecans and topped with cinnamon buttercream frosting. To toast the pecans, preheat the oven to 350°F (176°C). Line a cookie sheet with parchment paper or a silicone baking mat. To make the cupcake batter, preheat oven to 350°F (176°C). In a large mixing bowl, cream the butter and sugars together until light in color and fluffy, about 3-4 minutes. Do not skimp on the creaming time. Add the egg and egg white one at a time, mixing until combined after each. Scrape down the sides of the bowl as needed to be sure all ingredients are well incorporated. 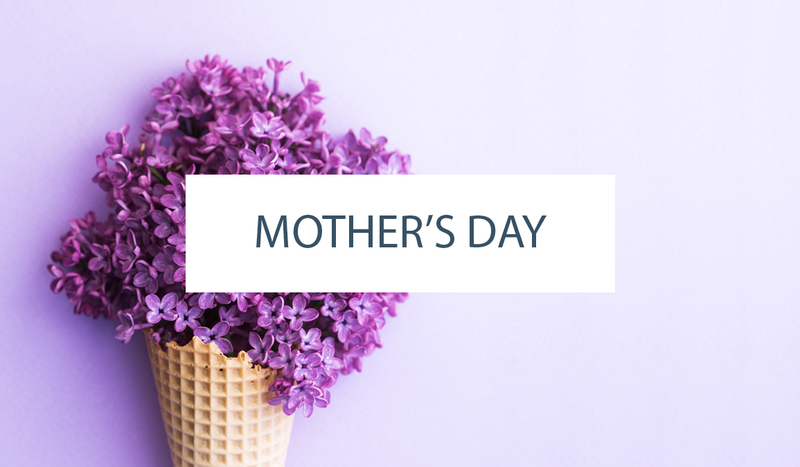 Combine the dry ingredients in a separate bowl, then combine the milk and water in a small measuring cup. Stir in the toasted pecans. Set the remaining pecans aside for later. Fill the cupcake liners about ¾ full and bake for 15-17 minutes, or until a toothpick inserted comes out with a few crumbs. Remove cupcakes from the oven and allow to cool for 2-3 minutes, then remove to cooling rack to finish cooling. Add the vanilla extract, cinnamon, salt and 1-2 tablespoons of water or milk and and mix until combined. Add additional water or milk, as needed, to get the right consistency frosting. 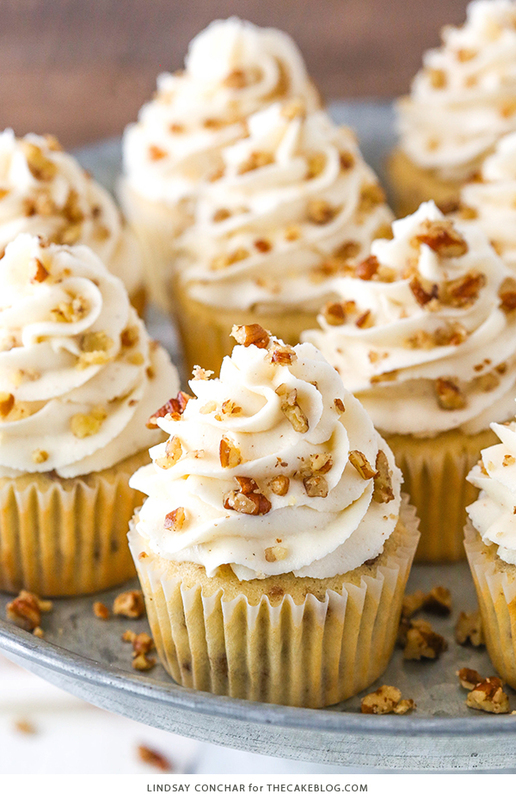 Pipe the frosting onto the cupcakes, then sprinkle with the remaining toasted pecans. Do you divide the toasted pecans in half? How much is added to the batter and how much set aside for topping g? Hi Sheila! 3/4 of a cup are used in the cupcake batter, leaving 1/4 of a cup remaining for the topping. Hope you love these! 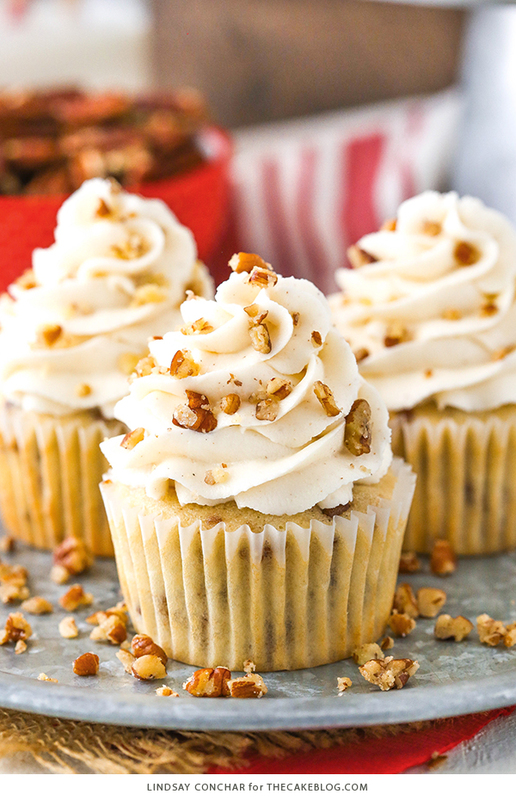 These look super delicious, and I do agree: pecans are great both for fall and winter! Do you use regular size muffin tins or mini-muffin Size? As written, this recipe uses regular size muffin tins. But you could certainly bake them in mini size if you prefer. Just keep an eye on your baking time, as the minis will bake faster! These were wonderful! I did add a little more cinnamon and maple extract to the frosting but I LOVED the cake recipe you had. They are some awesome tasting cupcakes! So delicious! Except I had to make the frosting twice because it was too runny and I couldn’t seem to get the right consistency, and i followed the instructions. I’m not sure what I could’ve done wrong because I’ve made buttercream before. Otherwise great!!! These cupcakes are amazing! Followed the recipe exactly as written!